YouTrack 2018.2 introduces a new Projects page, YouTrack Docker image, new sort options for sets of values in custom fields, redesigned Create Issue page as an experimental feature, and many more improvements. Hub 2018.2 adds a SAML authentication module, throttling by login, and personal data management. 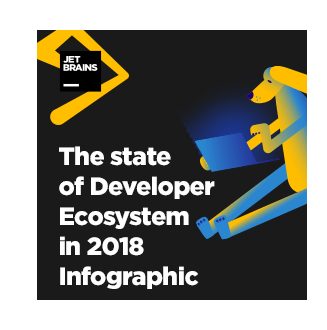 JetBrains' latest report on the Developer Ecosystem in 2018 presents the findings from our most extensive annual developer survey. The different sections of the infographics cover a broad range of topics: Programming languages (including new Go and Kotlin pages), development environments, team tools, open source, cloud technologies, databases, DevOps, and fun facts about us developers. ReSharper Ultimate 2018.1.2 — If you are experiencing slow typing, or if the completion popup displays slowly for you in the ReSharper 2018.1.1 build, ReSharper Ultimate 2018.1.2 comes to the rescue. Rider 2018.1.2 — This update fixes a code typing and completion issue, as well as addresses Unity issues that may have affected Windows users. Java Annotated Monthly: June — While there are no major Java stories this month, there are plenty of good articles to help us improve as developers and team members. Explore Java 8, 9, and 10 presentations from conferences earlier in the year, and a touch of design, architecture, and culture information. C++ Annotated: January – May 2018 — This most recent edition covers language standardization news, interesting recorded talks, a bug in GCC, const position, deprecated std::iterator, conference reports, and new releases. Copy and Share Data Sources in IntelliJ-based IDEs — This tutorial looks at three popular use-cases: duplicate a data source within one project, share data sources between projects inside one IDE, and copy a data source from one IDE to another IDE or to another computer. Using AWS Athena from IntelliJ-based IDEs — Amazon offers Athena, a service built on Presto, which allows you to query S3 data using ANSI SQL syntax. Learn how to access this data straight from the IDE. Introduction to Code Analysis in Rider — What is code analysis? How can it be used for an automated code review and help you improve the quality of your code? Once these basics are covered, dig into some of the inspection categories that are available to find out how they help spot and resolve potential issues in your codebase. Version Control Improvements in Rider 2018.1 — This blog post looks at partial git commits, additional grouping options, and more version control improvements in Rider 2018.1. C# 7.2 Language Support in ReSharper and Rider — This series focuses on the new C# 7.2 language features for which we've added support in ReSharper 2018.1 and Rider 2018.1. See how they help improve our code quality and how they work under the hood. ReSharper Performance Series — We are sparing no effort to improve ReSharper's performance. This blog series shares information about the minor and major changes that are in the works. What's New in ReSharper C++ 2018.1 — Learn about the ReSharper C++ 2018.1 release highlights: debug step filters, Includes Analyzer, a command-line tool to perform code formatting and cleanup in C++ projects, new code inspections, and updated Clang-Tidy integration. ReSharper C++ Includes Analyzer in Action — Includes Analyzer is a tool for locating and eliminating unnecessary header dependencies, thereby increasing compilation speeds. See it in action in the short demo. How to Use Git with DataGrip — There's no reason why your database SQL scripts should not be under source control right next to your team's application code. Dive into VCS and gain the knowledge to keep your database scripts and files backed-up and up to date. Vgo Integration Support in GoLand — A few months ago, the Go Team announced a new tool for Go package management – vgo. As enthusiasts of cutting-edge technologies, we immediately implemented support for vgo. Dig into the details and see what it can do. Debugging Containerized Go Applications in GoLand — Containers are becoming more popular for deploying applications, and Go applications are no exception. How should we debug these applications, which are running in the isolated environment that a container offers? This post will help make things clear. Case Study: YouTrack, Warhorse, and the Deliverance of Gamedev Agile Processes — How does a game development company use YouTrack? Read our case study with Martin Klima, the Executive Producer for Warhorse Studios, to find out. PhpStorm 2018.2 — This opening EAP brings Touch Bar support, FQCN completion, reworked Structural Search and Replace, simple CodeSniffer/MessDetector setup, and new icons. CLion 2018.2 — CLion has started the 2018.2 EAP with Google Sanitizers support, Gradle and compilation database project models, an ability to recompile a single file, a bundled Database plugin, and IDE performance improvements. AppCode 2018.2 — AppCode has rolled out the 2018.2 EAP with Database support, inline Rename for Swift, and TouchBar support. RubyMine 2018.2 — The new EAP features better code insight, significantly improved YAML support, and the long-awaited ability to attach to remote processes with the debugger. IntelliJ IDEA 2018.2 — Access these brand new features in IntelliJ IDEA: TouchBar support, advanced @Contract annotations, breakpoint intentions, enhancements in code refactoring, and improvements in Gradle support. MPS 2018.2 — The new MPS EAP has begun. Improved generator tests and more migration notifications are some of the new things you can expect. TeamCity 2018.1 — Try new features in the upcoming release: Read-only server, NuGet Feed at the project level, bundled Amazon S3 integration, and reworked Docker runner. Copyright © 2018 JetBrains. All rights reserved.